Mahogany Grill is on N. Aurora Street in the Ithaca Commons area, which is all torn up and under construction so we didn't spend too much time on a windy and very chilly day trying to navigate and explore through gravel and dirt and such. Did I mention it was really windy & chilly that day?! I was pretty darn cold. We first tried to grab a quick lunch at Ithaca Ale House, which is across the street from Mahogany Grill, but all their tables are bar height and the regular tables are up a step. Ugh. Plus, it seemed kinda dingy and dive-like inside. So we ended up at Mahogany Grill. I was a little worried because of the ratings/comments on Yelp and Urbanspoon but I am so happy we ended up here because not only was the atmosphere much more to our liking than Ithaca Ale House but the brunch special that day turned out to be a terrific and delicious deal. I found the interior to be cozy and inviting. Rich, dark colored wood. Interesting old artifacts on shelves on the wall. Lovely natural light shining in from the front windows. Our server was terrific. SP settled on iced tea while I chose hot tea. Lots of points for serving what I find to be one of the better Earl Grey teas: Harney & Sons. We both ordered the same thing, the brunch special of the day: Berkshire ham, potato pancakes with sour cream, 2 eggs any style (scrambled for me, fried for SP), biscuit, and fruit. This was a huge plate of food! The ham was a huge, thick slab and so darn hammy delicious. My eggs were nicely scrambled, and I ate those first since I really don't like cold eggs. The potato pancakes were, in our opinion, amazing. Some potato pancakes are smooth like a breakfast pancake. Some are entirely made of shredded potato. These were like a blend. It was creamy and yet there were also tiny grated bits for a bit of texture. I'm not sure what, is any, seasoning was used in making these, but these were not bland potato pancakes like I've had at many other places (and even made myself). This was just what we needed. SP managed to eat everything except a bit of biscuit. I got my biscuit and about 1/3 of my ham boxed up and ate it the next day for breakfast. We'd definitely go back for brunch - it looked like these same components were available on the regular menu in other brunch combinations (but maybe not this exact ham). It wasn't very crowded when we arrived without a reservation around 11:30, but by the time we left, it had filled up. Our Sunday morning in Ithaca was filled with a hike to the falls at Taughannock Falls. It was a beautiful, sunny, and warmish day, but the hike was all in the shade and by the time we finished the round trip, I was frozen. My fingers were so cold I couldn't even straighten them, or hold anything (like the camera). I was hungry and frozen! We first tried to go to Carriage House Cafe, but there was a 45 minute wait plus it's street parking only and the area is very hilly and steep, which isn't good for the wheelchair. So we went to Ithaca Bakery instead. They have a parking lot but this place gets very busy on Sunday at lunch time and we had to wait/circle a bit to finally get a space. The menu is HUGE! You order at a counter (there are several, depending on what you are ordering). Then you take a seat (if you can find one) and wait for your food. Since it was crowded, we snagged a table as soon as we saw a free one and parked me. SP used the bathroom while I used my phone to look at the menu and decide on a sandwich. Then he got in a line and used his phone to figure out what he wanted while he waited in line. He chose Van Dorn's Vegan: house made hummus, roasted red peppers, tomato, sprouts, on oatmeal wheat bread. I think it sounds disgusting, but he thought it was delicious. I chose The Parisian panini - roasted turkey, 3 fruit chutney, spinach, brie on toasted sourdough. I got the chutney on the side just in case I didn't like it, but it was delicious. This hit the spot, just filling enough. We'd go back if we're in Ithaca again. This isn't really Ithaca, but it was on our way from Cornell to Ithaca, in Elmira. It's not wheelchair accessible, so SP went in and got our food to go and we ate in the car. We both chose lunch combos - soup and half a sandwich. I had high hopes for the soup. SP chose Chicken Noodle soup and he enjoyed it - but I don't think he's ever met a soup he didn't enjoy. I chose Cream of Potato. At first, I really liked it even though it was not as creamy as I expected. There was a lot of dill. Sadly, by the third or fourth spoonful it was apparent there was waaaaay too much pepper in it. My mouth was tingling as if I was eating spicy food. SP tried it and also said it had way too much pepper. This did not get eaten. It got tossed. Yuck. SP had half a turkey sandwich and it was OK. I had half a ham and cheese and it was OK. I like that the ham was grilled, and the bread was, too, but this was not what I was expecting. I don't recall the menu saying grilled and I had been eating a lot of grilled cheese up to this point on vacation so I was disappointed. Since my soup was inedible and I had only half a sandwich, I ended up eating all the chips, and I don't like chips that much. I do not think we'd try this place again if we're in the area. 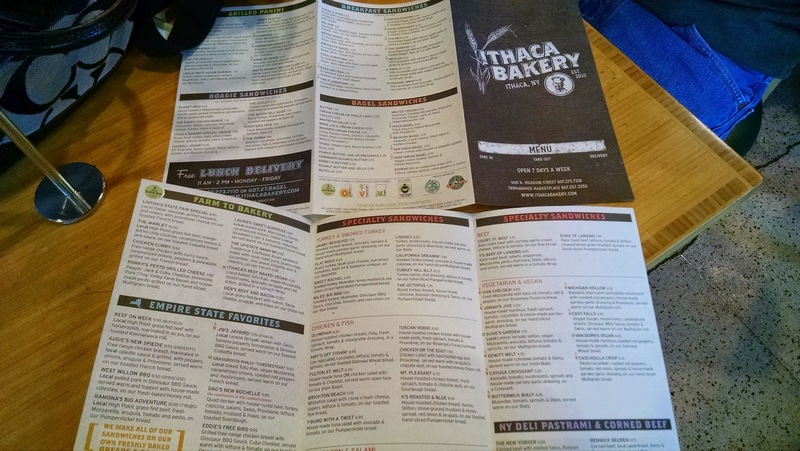 Did you ever try the Moosewood Restaurant in Ithaca? I have had their cookbooks for years and have always wanted to go there. We haven't tried the Moosewood. It was on my list, but we just didn't make it. Next time!